Artist Itaewon presents his first solo show ‘Broken Perspective’, a window into his vivid, fractured imagination. He envelops his audience in his imaginary compositions using a delicate balance of colourful arrangements combined with geometric line work. His work distinguishes movement, light, and power. A fascination with the macro and structures in nature led him to explore the beauty of natural intelligence. His paintings touch on a range of themes including architecture, vast otherworldly landscapes and micro-cosmic structures. He began painting while growing up in Seoul, South Korea and took his name from the area in which he lived. 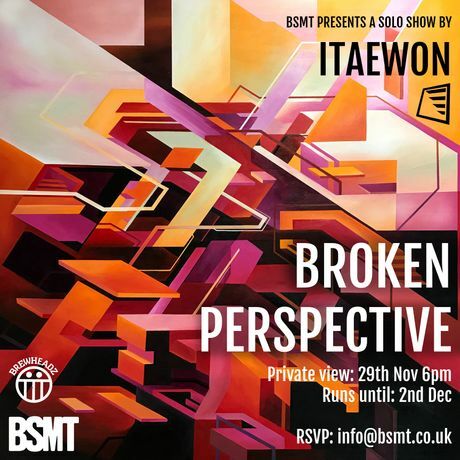 Itaewon’s series, ‘Broken Perspective’ comments on the value of process and correspondence. Each painting is in direct dialogue with the last, diving deeper into the realms of abstraction. Rather than relying on impulsive mark making to evoke movement, Itaewon has focused on critical placement of line and colour. Through the use of mathematics he suggests perfection and correlation to your unconscious, breaking the generic understanding of perspective. With thanks to the BrewHeadz team for coming on board as sponsor for the opening night!